A solid unit with fantastic features and sonic quality, built in the UK. Nothing at this price can touch it. Great build quality from a dependable brand. Flexibility of routing. Superlative sound quality. Can't select the Stereo Cue as a monitor source. For anyone with the vaguest interest in audio production, the name Solid State Logic is synonymous with technical innovation and the very highest quality analogue and digital audio consoles. As audio production techniques have changed, its product range has adapted to the new landscape. In our current DAW-dominated culture, SSL has provided us with two of the best examples of analogue/control surface hybrids - the AWS and the Matrix. In its X-Rack system it's included all the classic mic preamps, compressors and even a summing mixer configuration. 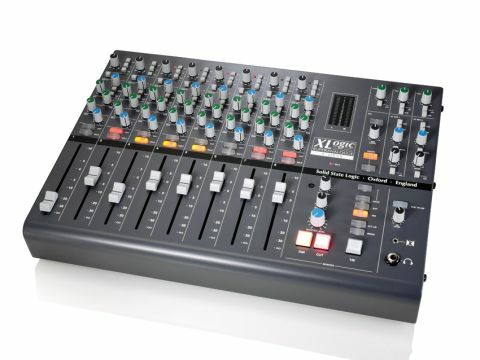 Therefore, it begs the question of the X-Desk: why bother bringing out what is ostensibly another summing mixer with no DAW control and no total recall? Well, it's true that the X-Desk lacks many of the features of its older and bigger siblings, but it also lacks the price tag. Within this price range, the summing mixer market is pretty crowded, so just what exactly does this unit from SSL offer us? First things first, this is a proper small desk - channels, cue sends, FX returns and a Monitor section with talkback are included. As with the Matrix, each channel strip has dual line inputs that arrive via D-Sub connections on the back, so in total you have 16 line-ins. At the top of the channel strip is an indented line trim centre with +/- 20dB of gain. The first of the three switches swaps between the Main and the Alt line-in. The second is a phase reverse, which is always good to see, and the third is the insert in and out. There are eight inserts, one for each channel, which also connect via D-Subs. Just below these is another switch that swaps the channel direct out between pre and post fader. The direct outs feed another D-Sub, which gives you the option of riding a fader while recording, something that's pretty essential in any set-up. "This is a proper small desk - channels, cue sends, FX returns and a Monitor section with talkback are included." Below the Input section comes the Stereo Cue and the FX sends. The Stereo Cue has Pan and Level controls and two switches. The first offers pre or post the channel fader, and the second switches the cue over to the Alt input. This is how you get 16 inputs on a mixdown - the Cue Balance can be sent to the mix buss along with the outputs of the eight channels. Below the Stereo Cue are the two FX sends. The last knob is the Channel Pan pot and beneath this are the Cut and Solo switches, which light red and yellow respectively, and the 100mm channel fader. The knobs all feel firm and positive in operation, as do the switches. If we have one criticism though, it's that the faders feel a bit light. We'd definitely prefer them to be firmer, but they're smooth in operation and, because of their long travel, are pretty precise. On the top-right of the desk are the Cue and FX send masters. They each have an AFL button with an LED (AFL and Solo buttons should always have individual LED indicators). The FX send masters both have a second switch to make them pre or post, the default being post, which is the right way around. There are two stereo returns that can be routed to the mix buss and/or the cue sends. There's another switch for Mono on each of them and a Pan and Level control. In Stereo mode, the pan knobs act as balance controls and in Mono mode they act as pan pots. Next to these are the mix buss controls. At the top of this section is a switch that brings the cue sends into the mix buss for when you want to sum all 16 inputs. Below that is a level knob that goes from infinity to +10dB via a centre indent for unity gain. Below this are two switches for the Master Stereo Insert. The first switches it in and out, and the second enables you to sum the pre insert mix buss signal with the insert return. This means that you could have a stereo compressor fed from the stereo buss and mix it into the stereo buss via the output level control of the compressor itself. This could prove to be a very useful feature and is a really nice touch on such a small unit. The bottom-right corner of the X-Desk has the Monitor and Headphone section. Starting with the Monitor, you have three knobs. The top one is the Talkback level control. Below this comes a Dim level control, which has a good range of -30dB to -3dB and, finally, the Monitor level control, which in true SSL style really does go right up to 11. Below this are two big switches for Monitor Dim and Monitor Mute. "The eight faders and the way that SSL has put the X-Desk together mean that you can have a very flexible system at your fingertips." Next to all of these are the Monitor Source selects, of which there are three choices: Mix, External Source and the iJack. In normal operation, these are cancelling switches (selecting one switches off the others), but if you select the Sigma switch above them you can select two or all three of the sources at the same time. This is very useful if you need to check a part from a CD or iPod and play along with it. Below these you have an Alt Monitor switch, so you can have two different sets of speakers hooked up to the desk. Underneath that there's a Mono switch and at the bottom is a generously sized talkback (T/B) switch. Lastly, the bottom-right corner has a 1/4-inch headphone socket and a 3.5mm socket known as the iJack. This enables you to plug your iPod or other MP3 player straight into the X-Desk. Above these are the Headphone Level control and a switch to send the cues to the headphones (the headphones normally follow the monitor source selector). When the cues feed the headphones, the talkback also goes there. If all that seems like a very long description of a very small machine, it is. The X-Desk may not be huge, but it certainly isn't lacking in features. However, the really big question is: how does it sound? Well, the answer to that is 'bloody great'. We started by taking a few of our more recent 'in the box' mixes and splitting them into stems. The results were very impressive. Tracks felt punchier and more open. The low-end was more defined and the stereo seemed wider. Exactly the feeling we had when we tried the Matrix a while back, but also, admittedly, the same feeling we have had using several different good-quality summing mixers. So what sets the X-Desk apart from the crowd? Well, it's the fact that this is a desk. Those eight faders and the way that SSL has put it all together mean that you can have a very flexible system at your fingertips. Let us explain. Imagine you already have some mic pres, EQs and compressors. You have 16 or 24 inputs and outputs from your computer and a couple of sets of monitors. Your normal mode of working involves having several inputs set up to the computer, maybe a couple of mics, a DI and so on, which you run through your pres, EQs and compressors and plug directly into your A/D converters. Sometimes you want to mix some of these sources together to make a mono sound source, sometimes three or four of them to make a stereo source, and sometimes you want to send all of them to individual tracks. At the same time, when you mix, you want to use eight stereo busses from your system. Without a desk you can't do most of that. With an X-Desk you could run 16 outs to the Main and Alt line inputs to give you eight stereo summing groups and then plug your pre/EQ/compressor chains into the insert returns. When you're tracking, run your mix via the Alt inputs to the Cue Mix, which in turn is sent to the Stereo Mix. If you want your vocal chain that comes into insert return one, simply press the Insert button and you have it. If you've wired the direct outs to your A/Ds, all you need do is select Input 1 on your DAW and it's ready to record straightaway. If you want to ride the level to tape, then make the send post fade, or simply leave it pre fade and use the fader to set your latency-free monitor level. With multiple inputs you can mix them on the faders and record them via the stereo out, and you could also bounce up to eight sources from your DAW via the desk to take advantage of some analogue EQ and compression, all without having to re-patch anything. Taking into consideration that this little baby also handles your monitoring and headphones, it's going to become the heart of your studio very quickly. The only trick that SSL seems to have missed is one simple thing: there's no switch on the monitor section to select the Stereo Cue as a monitor source, so to hear it independently of the stereo buss you must patch its output to the Ext Source input. This way you could have a monitor balance from your DAW and a stereo mix returning to it at the same time, useful when mixing multiple input sources or bouncing down. This is certainly the simplest desk SSL has ever made, but it packs a hell of a punch in terms of both features and sonics. If you want a summing mixer, a small console and a monitor controller, this could well be the unit for you; in fact, at this price you'd be daft to ignore it. SSL has set a new standard and could well have cornered a new market.